Ifthere are any conflicts of interest. Before a critical review of the paper is embarked upon it is necessary for the author of this paper to elaborate on the concept of the critical analysis. Last (2001) has defined the process of critical appraisal as a process in which an assessment of evidencesfor the study is carried out for understanding the legitimacy of the study process, data validity, relevance of the methods and procedures for completion of the study, completeness ofreporting, conclusions, agreement with the ethical rules etc. These rules of evidences can be different for different types of studies and papers. However the study which is being critiqued here looks into a statistical analysis to understand if there exists any uniqueness of the personality of the nurses who are working in the emergency department of the hospitals (Kennedy et al. 2014). Kennedy et al has confirmed that this study is necessary in view of the fact that it is possible for the personality traits to affect the choices related to the occupation. However there is a significant absence of researches exploring this exact topic for the workforce decisions of emergency nurses. Due to the quantitative nature of this study the assessment process has also been designed accordingly so that the relevance of the analysis increases. One of the most important part of the studies is the title of the same and this factor for this paper is significantly appropriate. The research title for the article which is being discussed here is formed as a question and this develops a level of curiosity in the mind of the reader successfully and articulates the research question which is begin dealt with in an apt manner. The title also talks about the underlying factor for the study which is personality of emergency nurses. Following this the credentials of the authors of the article can be looked into.In view of the fact this article looks into the personality of the nurses who are working in the emergency department of the hospitals, it can be said that the credentials of the authors are perfectly suited for the study and the report. Kennedy who is a part of Trauma Service of St George Hospital, which itself is a wing of emergency department is able to impart the process of the study with a lot of sincere knowledge. Curtis is also from Sydney Nursing School and should be well acquainted with the nurses’ mentalities and personalities. Waters being from St George Clinical School is also an authority in the medical field and can be very efficient in the spectrum of this study. The abstract or the summary that has been given by the authors is segregated in four parts including background, methods, results and conclusion from the study. The couple of sentences in the background section clearly gives the aim of this study and the gap which it wants to fill in terms of research evidences. The subsection of the methods also concisely gives the methodological framework which has been used along with the results received from the same. The conclusion also concisely gives away the interpretation of the results of the study. The summary section of this research is written with a lot of sense of brevity as well as very objectively and hence this section is very well articulated and gives a lot of understanding to the readers regarding to what to expect in the next sections of the study. This is followed by the introductory chapter of the study which clearly details the backdrop of the study as well as the necessity of the same in the overall scheme of the research and studies in the field of the medical science. 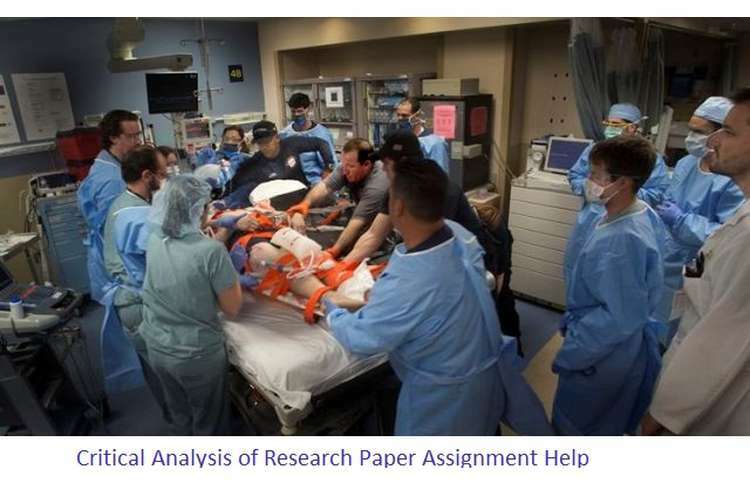 This section also clearly shows why the research question is important and how the understanding of the research topic and the research results can help in improving the related factors for the medical and health service providing industry. This section also contains a small note on what is already known regarding the topic of the study as well as the way this paper contributes to the same. This is a wonderfully well-developed few sentences which summarises the overall background and the objective of the researchers for this paper and the importance of the same in the practical field of medical practices. This section also details and references the previous few studies which have been done on this topic in the distant past and why the same are not relevant in the modern day medical industry. This introduction section for this study also doubles up as a small discussion on the previous literature on the topic of the study. This, in spite of a lack of obvious section on literature review, is justified in view of the fact that the authors have been able to establish that there are not much previous studies on the subject which warrant a separate section on the same. However outcomes from few old studies on this topic has been thoroughly analysed and few studies on the personality of the workers have been referred to. However this critic feels that there could have been a more detailed discussion on the personality of the workers, although a lack of which does not hamper the scope of this current study. Finally this section gives the hypothesis of the study. The following section on the methodology research unambiguously states the methodical framework which has been implemented by the authors for successful completion of the study. The process and logic of sampling, the research instruments which have been used as well as the processes implemented for the collection as well as the analysis of the data collected through theseresearch instruments have been detailed in this section thoroughly.The sub section of the data collection approach also confirmed the compliance to the ethical guidelines by the researcher for this study as well as the various enablers which were provided to the respondents for helping them in responding to the research instrument. This section, also can be confirmed as a very well developed one which touches upon all the aspects of research methodology. However it is expected that the research instrument for this study is given in the body of this section or in the appendix of the study, which is not present. Except this the author feels that this section is well rounded and justifies the research work completely. The following section on the results obtained from the study is segregated into two sub sections, one each for demographic profile and personality profile. The demographic profile shows that there is not much scope of any bias in the data despite a higher proportion of female participants in the study in view of the fact that the distribution is similar to the demographicsof the specialty critical care and emergency nurseworkforce across the country of the study. The more important sub section on the personality profile of the respondents classified the aspects which are important for this specific type of workers and tests their performance on those exact parameters. The statistical results from the one sample t test with combined population norms was detailed to compare with the population norms mean score for the emergency nurses for testing the hypothesis. It was shown that the emergency nurses score better than the population score in terms of openness to experience (defined as being broad minded, tolerant of others), agreeableness (defined as being e thoughtful, considerate and helping), and extraversion (defined as having capability for engaging in conversation easily with strangers and being comfortable in noisy environments). This segment of the report, which is the most important, despite not showing the statistical calculations and not giving too much pictorial representation of the data, justifies the research approach and thoroughly gives the outcomes of the testing. The raw data use for the study is also not present in the report body or the appendix which can be confirmed as a limitation of the report. The following section discusses the results obtained from the study and the interpretations drawn from the same in light of the practical aspects of the methodical industry. This also links the results with the characteristics of the work profile as well as work environment for the emergency nurses and confirms that the personality traits of these respondents suggest that nurses who demonstrate thepersonality characteristics of extraversion, openness toexperience and agreeableness are likely to be suited toemergency nursing work and have the capability for functioning in the frequently stressful and fast paced environment of work for this profile.This also is linked to the training and retention of the nurses and experienced workers for this field which can be used as practical learning for the decision makers for this side of the medical service providers. This section also critically gives the limitations of this study and the previous studies on this field and the ways in which this study can be expanded or improved upon or can be extended to the other fields of nursing (Ozer, 2013). The concluding chapter of the study gives out the already stated understanding from the study and completes the process of addressing all of the initially identified 10 aspects on the basis of which this study was critically analysed. The other smaller remaining sections looked into the authorship of the study the disclaimer on the conflict of interest as well as the research ethics statement. It can be confirmed that as per this critic there is no significant error in the study and the report development and broadly this is a well-conceived and well implemented piece of relevant and valid work of research. Kennedy, B. Curtis, K. Waters, D. (2014) The personality of emergency nurses: is it unique Australis Emergency Nurses J. 2014 Nov;17(4):139-45. doi: 10.1016/j.aenj.2014.07.002. Ozer DJ, (2013) Benet-Martinez V. Personality and the prediction ofconsequential outcomes. Annu Rev Psychol 2006;57:401—21.